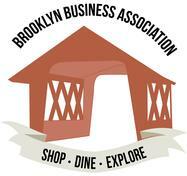 The Brooklyn Business Association is an alliance of local businesses with a common goal of promoting and enhancing the economic and social environment within the town of Brooklyn. We seek to continually improve our community standing as an exceptional place to live, work and do business. ​We endeavor to accomplish our objectives through actively meeting and working in harmony with one another and other organizations that share in our mutual purpose and interests. Attend a monthly meeting as a member or to learn about becoming a member.